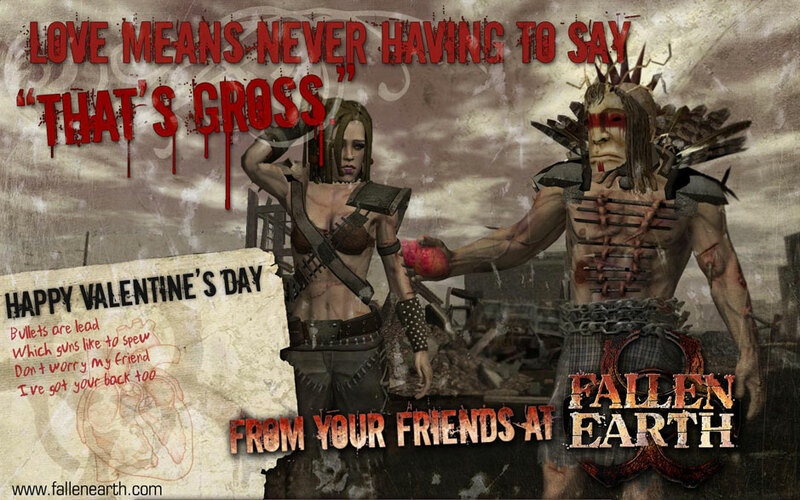 Work continues on upgrading Fallen Earth, but while you wait, we thought we would bring back an event with... Heart. What's better than surviving a nuclear holocaust and wandering your way across a blasted brown landscape rife with societal collapse? Why, sharing said wanderings with someone you love, of course (or at least, someone you lust after in that we've-got-to-do-this-for-the-future-of-mankind sort of way). Starting from February 13th through February 26th, the gruesome festivities will include a special "My Bloody Valentine" mission which features a Heartbreaker item and a crafting recipe that will enable players to rip out, preserve, and gift their hearts to whomever they desire.